HELP ME! My eyebrows are way too thin! I have sparse brows! I over-plucked my eyebrows! What can I do? Questions like those reach us every day. Our brow experts are giving away their best tips and secrets for perfectly defined brows. And don't panic! Sparse eyebrows can be repaired as brow hairs can be reactivated and grow to full eyebrows again in only a few weeks. Why do we get thinning brows? It's important to find out what might be the reason for your thinning brows. When your brows are over-plucked you have plucked your eyebrows too much and too often. In this case your hairs could either be growing very thin, only sparsely or not at all. So be careful when plucking your eyebrows. BEAUTY TIP: Read our blog article Pluck Perfect Eyebrows and find out how to avoid over-plucking and other mistakes when plucking your eyebrows. By taking proper care of your brows every day, you can delay the aging process. We will write more about this later. If you suspect that a hormonal imbalance or medication could be the cause of your thinning eyebrows, consult your GP. Chemotherapy is known for causing hair loss, including eyebrow hair loss. We will write more about this topic in this blog article. One of the easier ways to improve your eyebrow health is adapting your diet. Increasing your intake of folic acid, minerals, sulfur and vitamins A, B3 and E can make quite a difference. These nutrients have a positive influence on the health of your hair. You'll find tons of information on the internet about the type of food that is rich in those nutrients. Try to avoid situations or events causing stress and try to quickly solve problems causing you stress. Less stress does not only have a positive effect on your eyebrows but on your whole body! Once you know the reasons for thinning eyebrows, it's time to find out what we can do to promote hair growth. Can eyebrow hair grow back? Good news for all of you with thin eyebrows: eyebrow hairs can actually grow back! 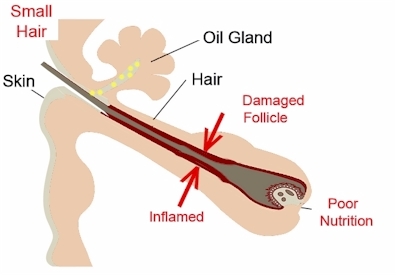 While dead hair follicles can't come back to life, hair follicles that are dormant (intact) can be reactivated. A good eyebrow growth serum can reactivate your hair follicles to re-grow beautiful, healthy and bold brows. We recommend starting with the use of an eyebrow growth serum as soon as possible to prevent your hair follicles from dying for good. When using an eyebrow growth serum in time you can expect beautiful and healthy brows within about 8 weeks. What is the Best Eyebrow Growth Serum? So now you wonder which eyebrow serum is the best? Before we will let you know about our personal favorite, we will show you the differences between the various eyebrow growth serums on the market. Types of Eyebrow Growth Serums – What are the Ingredients? You probably already know that there are hundreds of different eyebrow growth serums on the market. In fact, there are many varieties that can be divided into 5 categories. Each category stands for a particular active ingredient. The active ingredients of eyebrow serums are similar to the agents in lash growth serums. WARNING! The European Union has NOT approved Bimatoprost as a cosmetic ingredient. Eyebrow Growth Serum Review – Which one is the Best? We found that eyebrow serums with the active ingredient Isopropyl Cloprostrenate (category 1) always led to the best and fastest results. This kind of brow serum reactivates dormant hair follicles, which are hair follicles that are still intact but not active anymore. Eyebrow growth serums with Isopropyl Cloprostrenate extend the hair growth cycle, resulting in a longer growth phase for the hair. This unique combination will make your eyebrows thicker, fuller and stronger! Our brow experts are strongly convinced that the Aphro Celina Eyebrow Serum is the best on the market. Containing both Isopropyl Cloprostenate and caffeine make it a highly effective eyebrow growth serum. Apply daily before going to sleep. In only 8 weeks you will see that your eyebrows are fuller, thicker and looking much healthier. Both quality and performance make the Aphro Celina Eyebrow Serum our absolute favorite! And best of all? The price is very budget-friendly. Now available in our online shop! The eyebrow growth serum by Aphro Celina contains active ingredients with proven effectiveness. Developed and produced entirely in Germany, this eyebrow growth serum is thoroughly tested by dermatologists and eyebrow experts. Allergic reactions are highly unlikely. Your eyebrows will be fuller and thicker in only 2 months. Which eyebrow growth serums are safe to use? All brow serums with prostaglandin (1), peptides (2), black sea rod oil (3) and nourishing oils (5) as active ingredients are safe to use and are approved by the EU. In contrast, brow serums with bimatropost as their active ingredient (4) are NOT approved by the EU. Therefore we discourage using a brow serum with bimatropost. The risks of using a growth serum for eyebrows are very low. However, we do discourage using a brow serum when pregnant or breastfeeding. Please also refrain from applying an eyebrow serum on children or using an eyebrow serum when undergoing chemotherapy. Will my eyebrows become fuller and thicker if I use an eyebrow serum that is a 100% made from oils? An eyebrow serum that is purely made from nourishing oils does not contain active ingredients such as Isopropyl Cloprostenate. That's why we also call this kind of eyebrow serum “Eyebrow Conditioner”. Eyebrow conditioners contain oils and other nourishing ingredients. A well-known product is the Castor Oil. Using an eyebrow conditioner daily will make your brows much healthier. Hair follicles will be reactivated, allowing new hairs to grow. An eyebrow serum purely containing nourishing oils is usually a good alternative to expensive brow serums that only contain peptides. 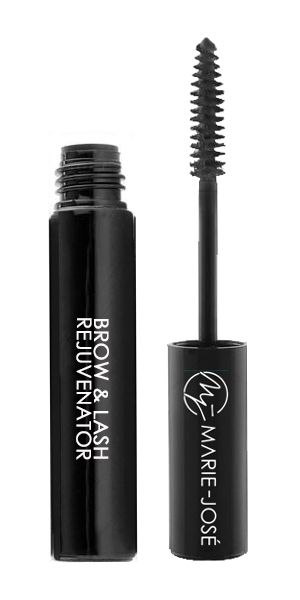 Our Marie-José & Co Brow & Lash Rejuvenator is a very good eyebrow conditioner. This serum will give both your brows and lashes a healthy boost! The nourishing ingredients are full of healthy nutrients, improving the look of your eyebrows and eyelashes. The Marie-José Brow & Lash Rejuvenator is a purely natural eyebrow serum, containing nothing else but natural oils and herbs. This eyebrow serum is also anti-inflammatory, rich in vitamin E and anti-oxidants. Below you can see a drawing of a healthy eyebrow hair. Underneath we are showing three pictures of 'problem hairs'. In the last picture you can see how the Brow & Lash Rejuvenator by Marie-José Cosmetics works. The root of the hair is located in the hair follicle underneath the epidermis. 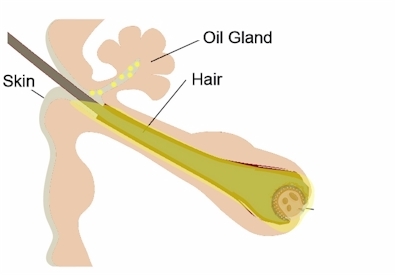 Almost all hair follicles are connected to an oil gland that secrete an oily or waxy matter called sebum. The sebum lubricates and waterproofs our skin and hair. 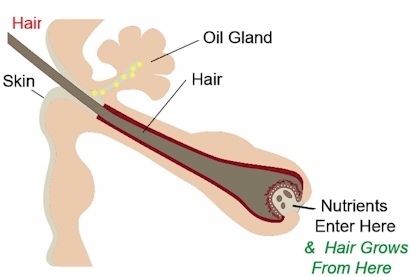 Little blood vessels at the base of the hair follicle supply the hair with nutrients. The nutrient supply results in hair growth. 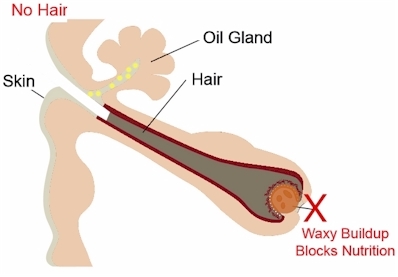 When waxy matter blocks access to the hair root, nutrients can't reach the hair. The nutrient supply can be inhibited or blocked, eventually causing the hair follicle to die. Over-plucking your eyebrows, hormonal imbalances, medication, diet and stress are all factors that can have a negative impact on hair growth. 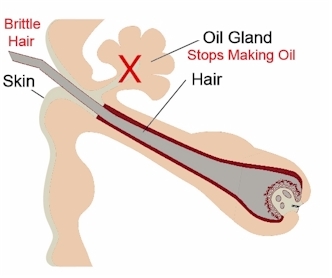 With the aging process the oil gland can stop producing sebum. Without enough sebum your hairs will become brittle. How does the Marie-José & Co Brow & Lash Rejuvenator work? The Marie-José Brow & Lash Rejuvenator releases the wax from the hair root, allowing the nutrients to access the hair. The properties of the unique formula are both soothing and hydrating for the hair. As a result, the hairs become softer and thicker. To prevent or delay eyebrow thinning, it is important to apply the Marie-José & Co Brow Rejuvenator daily. Intact hair follicles are also reactivated. Any questions about eyebrow growth serums? If you have any more questions about eyebrow hair growth, brow serums or questions about our makeup products, don't hesitate to contact us here or send a message to: support@marie-jose.co. Hi, as soon as the lashes and brows have the desired length, you can go into 'maintenance mode' and use the product 3 times a week. If you see a decline in hair length we advise to stop using the serum for a week or two and then restart again. You could also try Aphro Celina to see if that works for you. I’ve been using Reviabrow and Revitalash. And I was amazed and excited as to the results. However once I stopped, I lost all the regrowth. So I started again, and never stopped. I’ve been using both products for 8 months every night. But again, even with constant use, I’m loosing the regrowth. My brows are thinner and my lashes are shorter. Is there a better product that will maintain the regrowth?